CLOTH. This is a dance of elegance rather than of motion. The slow, graceful walk and gentle sway in time to the music contribute to the dance’s stateliness. The gentle motion of the shawl folded over the arm is in harmony with body motion and drumbeat. Dress varies according to the tribe and individual. Buckskin or cloth leggings may be beaded in symbolic ways. 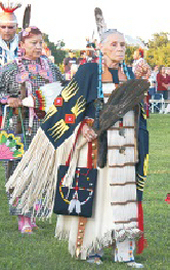 Beads are often worn with intricately beaded or ribbonwork regalia. WATCH FOR: an attitude of dignity. The dancer should stay in time with the drum, create a sway of the shawl, and stop on the last beat of the drum. BUCKSKIN. Formerly the exclusive dance of leaders and princesses, this dance is now open to all ladies. 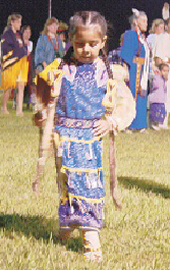 This was traditionally a dance of the northern tribes, but now southern tribes also dance it. The northern dancer usually stays in one area, lightly bouncing to the beat of the drum. The southern version has a slower beat and step. On the honor beats of the song, the dancer bows in reverence. This is a sophisticated dance style, not restricted to one age group. WATCH FOR: dancing in perfect harmony with the drum, while never breaking the sedate spirit of the dance. The dips and sways are executed with no break in dignity. Discipline is essential to the slow, graceful movement. FANCY SHAWL. This is the most modern of the ladies’ dances and allows expression of individual agility and grace. Many moves are very intricate, but are always in harmony with the drum. Grace is always expresses. The dress is brilliantly colored and often intricately beaded, as may be the accompanying shawl. WATCH FOR: how well the individual steps and motions express and harmonize with the drum. Being in time with the beat is important, as is the ability to end the dance precisely. JINGLE DRESS. 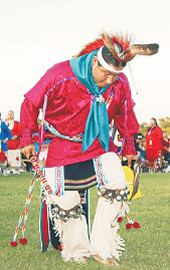 Originating among the tribes of Canada, this dance is relatively new to the southern plains. It is a very old dance which had spiritual meaning, somewhat clouded by time. It is a dance of pride and dignity, allowing a significant amount of individual expression. There are no set patterns, but the dance is very active and exciting to watch. 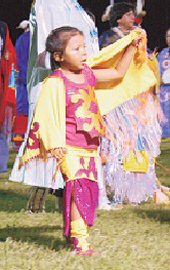 The jingle dress is colorful and furnishes much of the musical accompaniment to the dance. 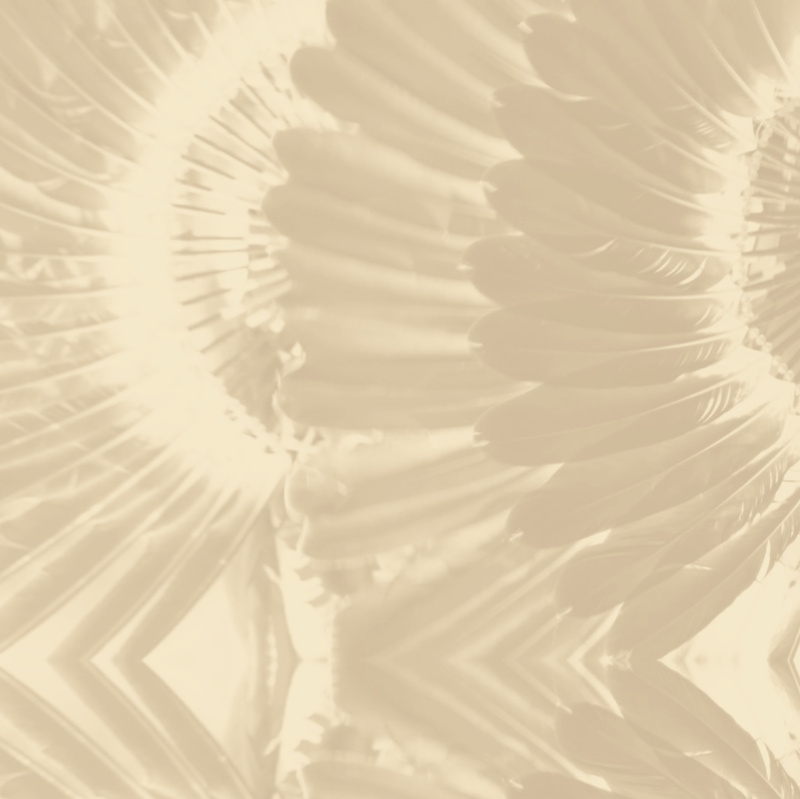 Long, tubular cones form a fringe-like decoration which “jingles” as the dancer moves. WATCH FOR: pride and grace of attitude, and a certain reverence. Dance steps and body movement not in time with the music are easily detected because of the music of the dress itself. FANCY DANCE. The War Dance has taken on new meaning. It recalls deep seated traditions and passes on pride in Native American Culture. The fancy dance regalia, and the intricate steps, allow the dancer to express his own emotions in the very fast pace of this dance of valor. 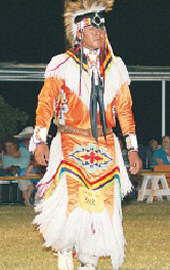 The regalia features feather bustles, one at the top of the back and a larger one at the bottom of the back. 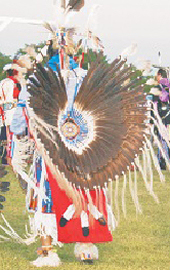 Headdresses are topped with one or two feathers which move to the beat of the drum. WATCH FOR: following the rhythm of the drum, the motion of the head, and the flow of the body. Styles are individual, but the change of pace is important. 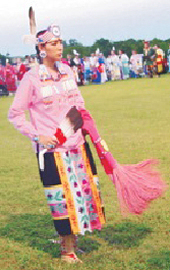 As in all Native American dancing, ending on the last beat of the song is significant in the judging. STRAIGHT. This is a “gentlemen’s dance,” telling a story of a hunting or war party on the trail of an animal or enemy. The dancer is constantly searching for his prey. There is a triumphant “whoop” when the trail is sighted. The dress usually includes an otter hide extending down the back, a roach headdress and ribbonwork. WATCH FOR: staying in step with the beat and looking convincing in the search. Pay special attention to the “story line” told in the actions of the dancers. TRADITIONAL. This may be the original dance of the northern plains Indians. It allows for much individual expression. The story line is of a war party recounting its feats for the tribe. The interest is heightened by the use of a long “coup stick” and by the motion of the feather bustles. The tempo of this dance is slower than the other dances, and the dancer always faces his enemy, never turning a complete circle. The dancer’s face may be painted to intimidate the enemy. WATCH FOR: a developing story line as the dancer challenges his enemy. 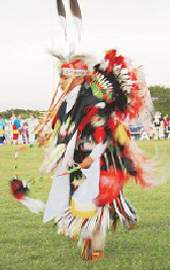 The dancer will mimic each element of his regalia (eagle, porcupine, etc.). His tempo is slow, but in harmony with the drum. GRASS. 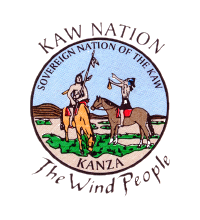 Differing versions of its origins include: an expression of the gentle swaying of the grass on a windy day, as shown in the movement of the dancer’s abundant fringes and ribbons; trampling down the long prairie grass when preparing for a tribal ceremony; or celebrating victory over an enemy. WATCH FOR: body motion causing the flowing regalia to move like the long, blowing prairie grass. It should be danced in perfect time to the music, responding as the grass does to the motion of the wind. This dance is an expression of the harmony of the universe.